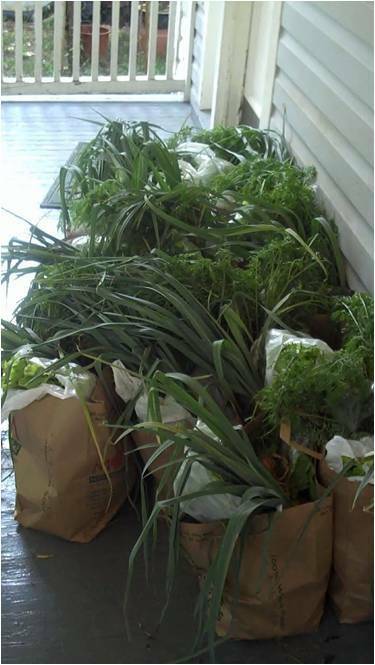 Recieve a splendid variety of produce delivered to your pickup site weekly in Shepherdstown. You will sample over 150 varieties of vegetables, fruits and herbs. Each week’s harvest yields its own unique share bag. Plan on plenty of those favorite staple vegetables, plus a healthy portion of the exotic and novel. Quantity and variety progress with the season. 4 Responses to What’s in a Share? Is Laytonsville, MD near the I-270 corridor? When do you deliver. If I am away on Vacation what happens to my deliveries? Do you deliver to Anne Arundel County area? West River, Edgewater, Deale? I am in those areas for 6 weeks of the summer. Just trying to see if this is a possibility for either area! Under “What’s in A Share,” which is under “What is CSA” in the black menu you will find a list of the sites we currently serve. We do not currently have a Rockville site, but many people from Rockville use our Silver Spring site. If you wanted to start a site in Rockville, and it was reasonably close to I-270, I would imagine we could add it this year. If you are going to be gone for 6 weeks of the CSA, I’d recommend that you find someone (a friend or neighbor?) to buy that portion of your share. Once people see how much you’re enjoying your share, they wish they had signed up when shares were still available. It’s usually very easy to find someone who would be happy to buy your unused weeks from you!